If it’s Thursday night on the island of Nevis, then you’ll find three shot glasses perfectly positioned on the mahogany bar counter at 101 Rums Bar. Like a magician ready to perform a sleight of hand, Mark Theron stands ready and willing to work his rum magic for a new group of students. Theron’s gallery is comprised of travel savvy vacationers who fly from around the world to luxuriate at Nevis’ posh Four Seasons Resort. 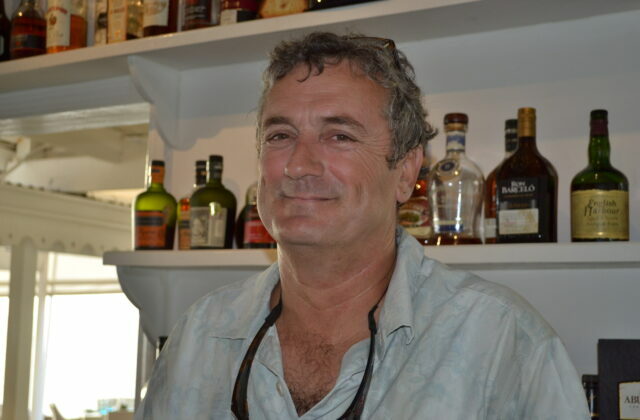 The vacationers are in Nevis to enjoy a real Caribbean experience, in this case, learning about the spirit that for centuries has been the drink of choice for pirates, navy officers, beach bar owners, and collectors like Theron. Theron journeyed to Nevis after first having set up shop in the sail making and hurricane protection business on the island of St. Martin. The now 50-year-old Theron confides that his personal rum story began after drinking a rum named Red Heart while serving as a 17-year-old soldier in the South African Air Force. Today, Theron’s personal collection of rum varieties is 200 and counting. While mesmerizing students with stories of rum history and rum making at 101 Rums Bar, Theron actually has 126 rums at his disposal. The bar, connected to the Four Seasons oceanfront Mango Restaurant, is building a reputation as a Caribbean rum destination site. The bar and restaurant is also home to Kendie Williams, an award-winning mixologist, who concocts colorful rum cocktails for vacationers on a nightly basis. The three shots that Theron focuses on at the beginning of his presentation represent the categories accounting for the rum industry as we know it. We’re talking Ron for Spanish rum, Rum for English rum, and Rhum for French rum. The students’ mission, if they choose to accept it, is to inhale and then sip these diverse categories of rum in the hopes of not only determining which they like best, but also to earn a certificate for their night of rum tasting. For Theron, the best part of his night is sharing with students how studying the history of rum is like journeying across the Caribbean. Theron counsels students in how to read a rum label, what to look for when buying a new rum, the difference between column stills and pot stills when making rum, and the best way to expand their rum palette. “Personally, I’m always seeking out new rums. I love the anticipation just before taking that first sip. 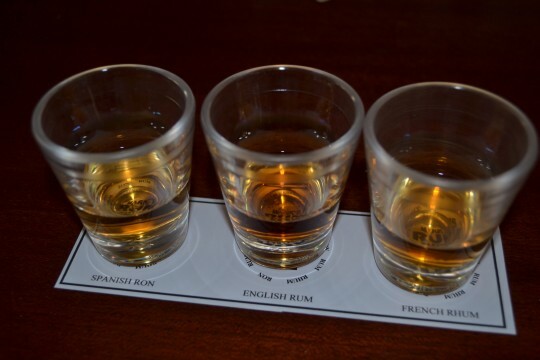 Here, at 101 Rums Bar, we like to tickle our taste buds and discover our new favorite rum,” Theron said. When asked which was the most expensive rum currently stocked at 101 Rums Bar. Theron pointed skyward to a top-shelf rum in a black container embossed in gold. “The Appleton Estate Jamaican rum is aged in oak barrels for 50 years before serving. Here at 101 Rums Bar, a shot can be purchased for $450,” Theron said. For those concerned if price dictates quality, Theron remarked that ultimately, it all comes down to personal taste. 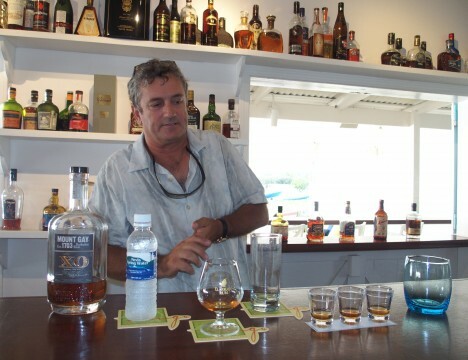 “For a rum lover like me, all rums are good, some are just better than others,” Theron said with a smile. After a night of rum appreciation, the students admired their certificates before hailing bartender Williams in the hopes of advancing their newfound rum tasting abilities. Theron beamed like a proud Papa while watching and listening to his new protégés speak his language. 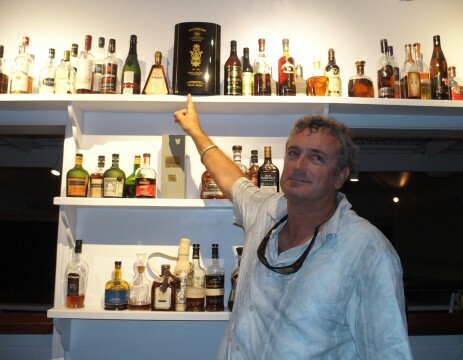 On the tiny island of Nevis, the 101 Rums Bar is a great place to talk ron, rum, and rhum.